Fear not, gentle reader, not some gruesome disembodied piece of anatomy but today’s destination for the Wrens-Nest. Another day of not going very far, a mile and a half to be precise, but we did do the six Grindley Brook locks including the three lock staircase where each lock leads directly into the next. Then it was just a fill of water and disposal of rubbish and we were away. We must have done about half a mile when a crew member from another boat that had been watering up came hotfooting it back down the towpath, they had left their keys at the waterpoint! When he caught us up again, with keys safely retrieved, we offered a lift which he gratefully accepted and told us a tale of how he had become part-time gravedigger and told his wife that he had to swear vows and join a secret society to get the job. His wife was taking it all in but needless to say he just went a bit too far and she realised that he was kidding her! We reached New Mills Lift Bridge which someone opened for us (hooray) and then reversed into The Whitchurch Arm where there are 48 hour moorings (an arm is a subsidiary branch of a canal). In this case it used to go to the centre of the town but was abandoned in 1944 and later filled in. 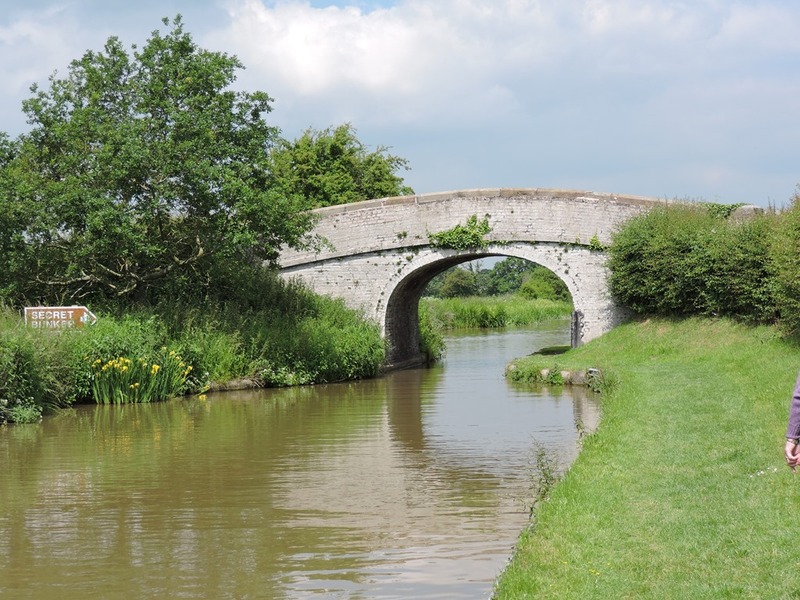 With the support of the town council The Whitchurch Waterway Trust was incorporated in 1988 and the restoration of the first part of the Whitchurch Canal was completed in 1993. They have ambitious plans to create a new basin and further moorings. After lunch we caught the 205 bus into town and bought some provisions including some burgers for our tea from one of the town’s four butchers. As the 205 is a circular route it was difficult to know where our stop was, but the bus driver couldn’t have been more helpful and set us down even nearer the canal than the stop we had found for ourselves. 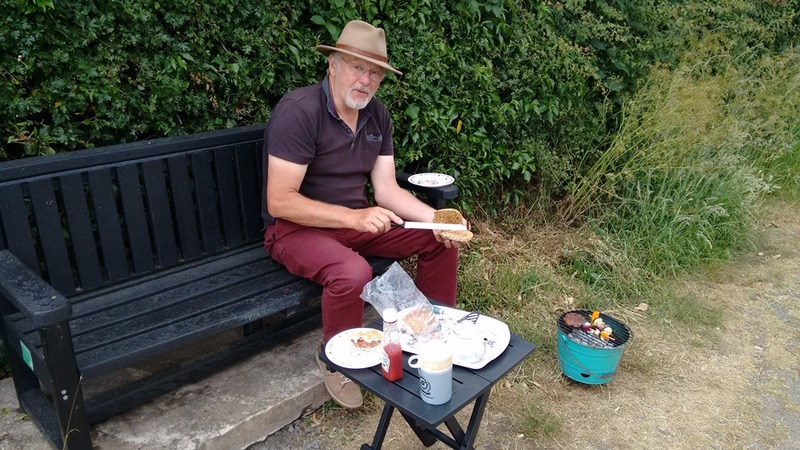 While we were in town we found ourselves a small folding table which we used later when we lit our bucket barbeque and sat on the bench thoughtfully provided beside our boat to cook our tea whilst Catty explored the adjacent nature reserve. It’s a lovely spot and we think we shall stay here tomorrow. 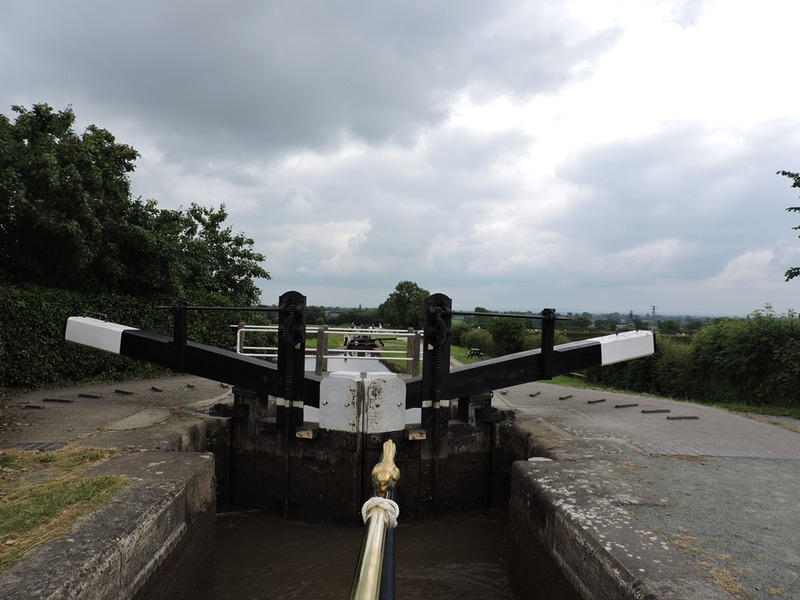 Today was but a short hop from Wrenbury with just one lift bridge today and that mercifully open and through four locks. 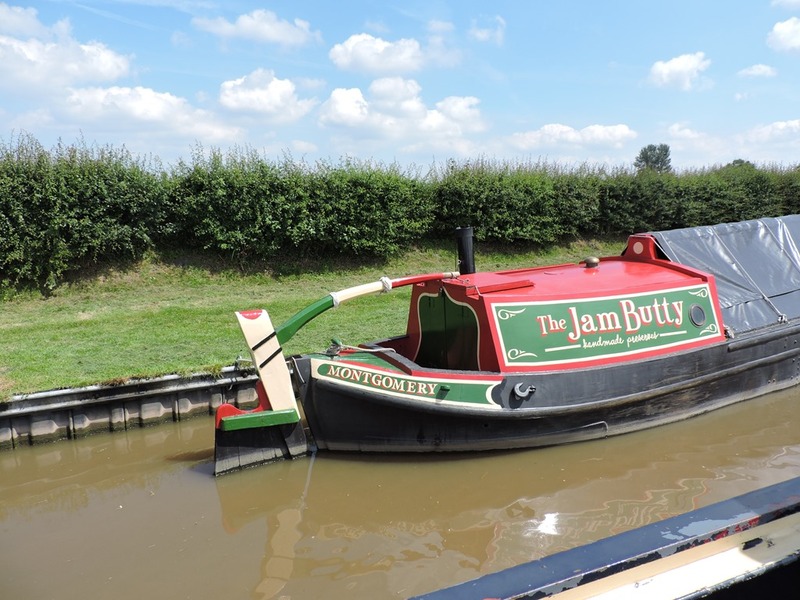 We passed the butty Jellicoe, usually paired with the fuel boat Mountbatten which, I believe, used to serve the Banbury area in the past but now plies the Llangollen Canal under the proprietorship of Jon & Hannah. We took a brief lunch beer stop at Willeymoor Lock Tavern, originally a Lock Keepers cottage but much enlarged now. It has a large collection of teapots . 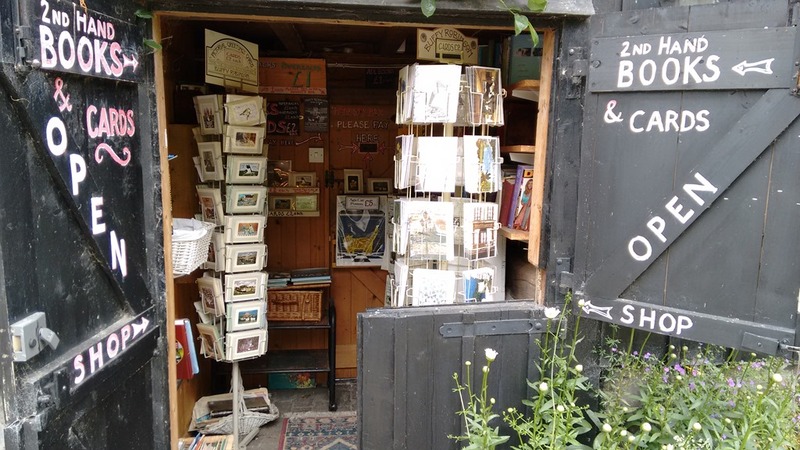 We have moored up just short of Grindley Brook locks which will be tackled in the morning, much to her delight Joy found a bookshop near the bottom lock. Last night’s mooring was next to the A51 and so this idyllic picture is a little misleading but it didn’t disturb our sleep and we were up and away before ten. 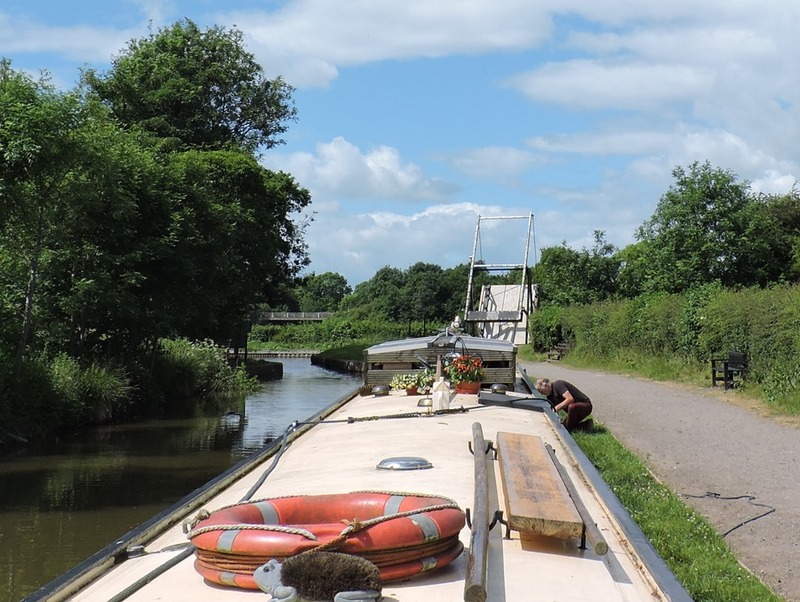 In 40 minutes we were back to Hurleston Junction and in a queue of three boats waiting to enter the Llangollen Canal by ascending the four locks. Joy didn’t enjoy these locks at all as she got the alignment wrong on the first one and then was lacking in confidence on the rest. To the north of the locks is Hurleston Reservoir, which is filled by water which passes along the canal from the Horseshoe Falls at Llantysilio. 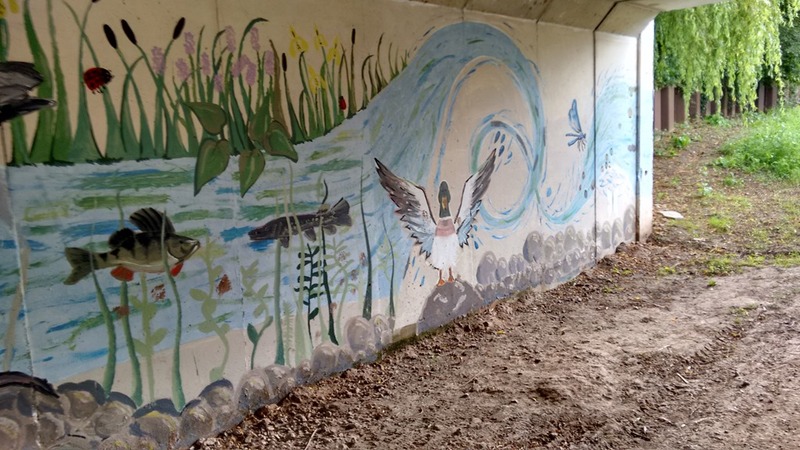 As well as supplying the canal, the reservoir is also used for drinking water, and holds 85 million gallons Around 12 million gallons flow along the canal each day to supply it. 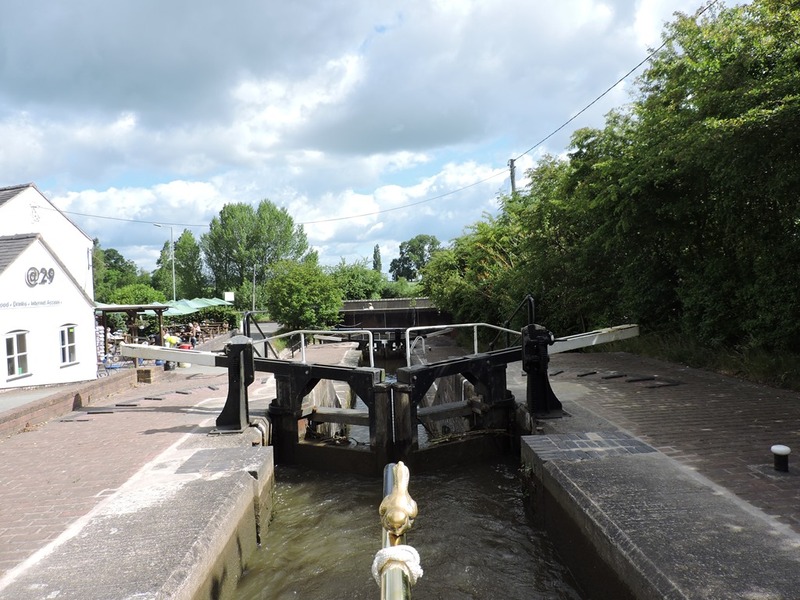 A result of this water flow is that each of following locks has a strong bywash where the flowing water goes around the lock, this has the effect of pushing your boat out of line when entering the locks. The first one seemed worst and Joy soon mastered the technique of compensating for it. We received lots of help from other boaters as well today. Just as soon as she was used to this we encountered our first Llangollen lift bridge which needed winding up with a windlass, this job fell to me while Joy took the boat through. No sooner she had was almost through three boats came in the opposite direction. It would have been rude to close the bridge for them so there was I, stranded one side of the canal while Joy was attempting to tie up the boat on the other, fortunately a lady from one of the other crews came to help her and we then had the boat which had been following us catch us up from and go through, they assured me I would get my reward in heaven! We had decided to spend the night at Wrenbury (where else) and nb Ruby Tuesday operated the next (electrically operated) bridge for us. and then we both moored up. 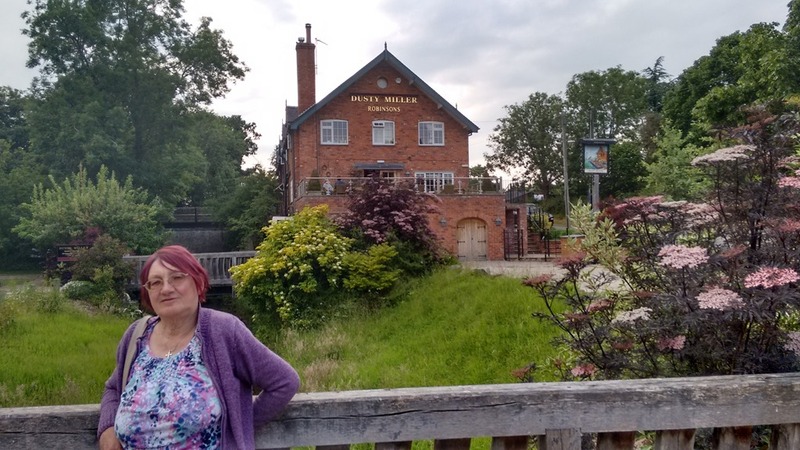 We treated ourselves to a meal at The Dusty Miller which was moderately priced and an outstanding meal, definitely not your usual pub grub! Lamb Tagine for me & Salmon for Joy, the chef produced a non-dairy lemon dressing for Joy and for desert a rum & raisin bread & butter pudding with banoffee sauce & custard. Beer of choice tonight? Lift Bridge Ale. Top Marks to The Dusty Miller. On the way back to the boat we picked elderflowers and Joy now has some elderflower cordial on the go, glutton for punishment isn’t she! 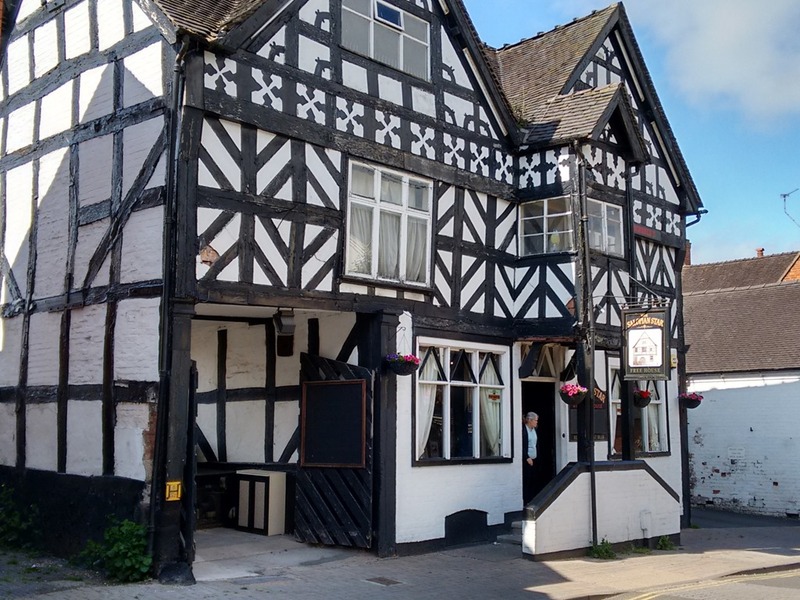 We had planned to stay at Nantwich today and do some shopping, but when we realised that to descend from the embankment it involved 48 steps, Joy declared that she had had enough of steps yesterday at The Bunker. Instead we opted to move on to Barbridge and catch the bus from there. 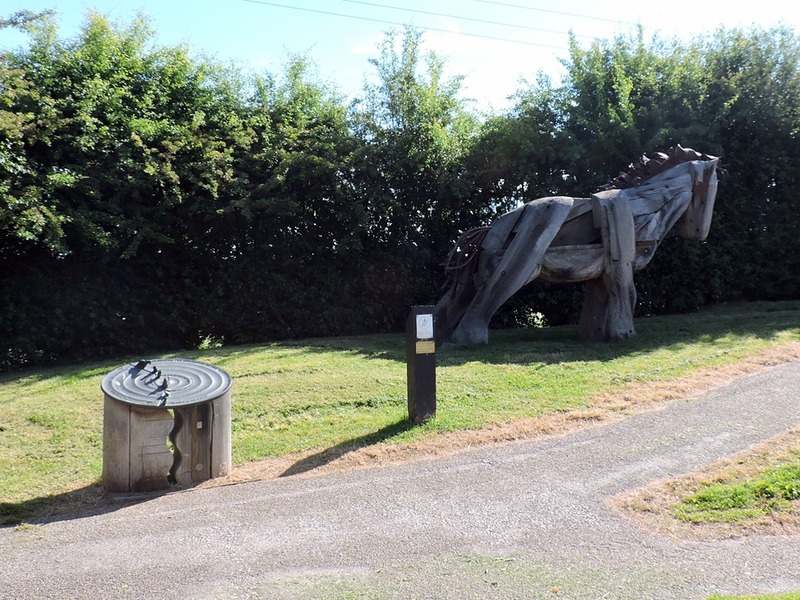 There is a canal-side sculpture trail the most impressive being the horse recycled from old lockgate timber I believe. 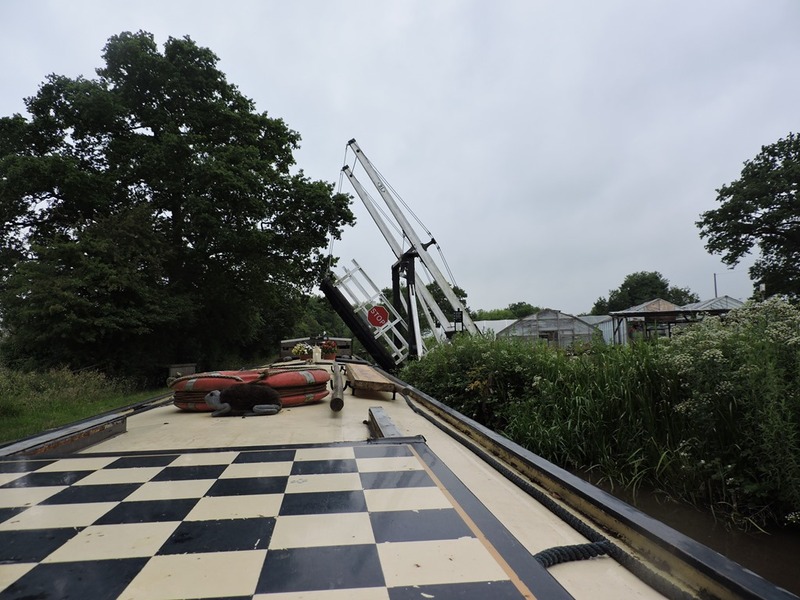 It took us just an hour to reach Barbridge, we winded at Junction and reversed onto a mooring, 40 minutes later we were on the number 84 to Crewe where we visited Aldi for groceries and R & B Music for guitar strings. 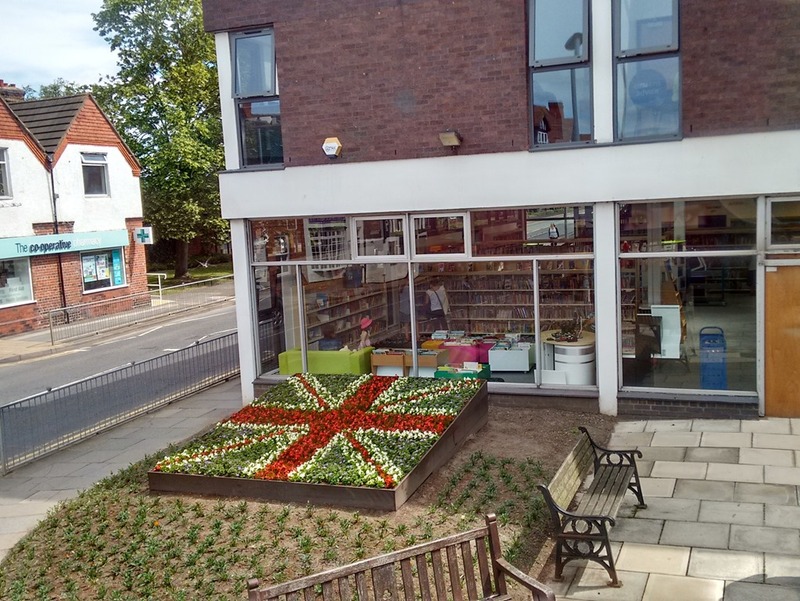 Then it was back to Nantwich bus station with it’s lovely flower display, we had lunch in town and then we returned to the boat, so passing over and under the Nantwich Aqueduct in one day. 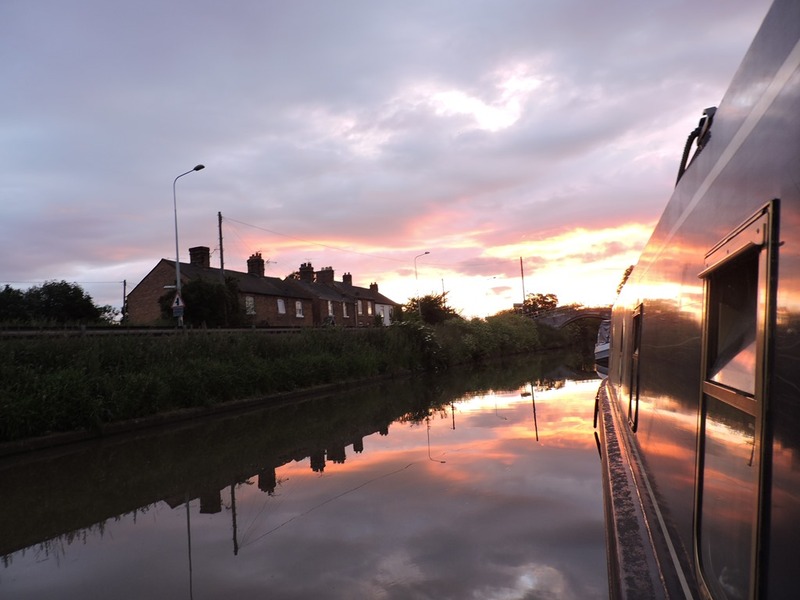 Tomorrow we’ll return to Hurleston Junction and on to another canal. 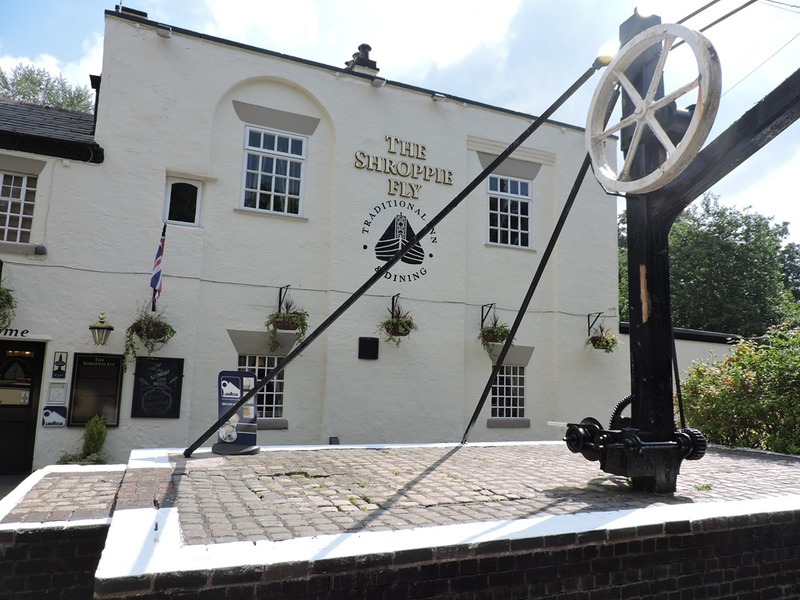 We left our overnight mooring at about 10am and recommenced our decent of the 15 Audlem locks, the flight wasn’t busy but we reached Audlem Wharf by 12 noon where we planned to have lunch at The Shroppie Fly. We had checked out their website and chosen from the reasonably priced menu, but when we arrived the menu was quite different and not quite so reasonable so we opted for the light lunch options of Cheesy Chips and Bread & Olives. Unfortunately Joy developed a migraine and so we de-camped, with food, back to the boat and decided to overnight on the 24 hour moorings just outside. 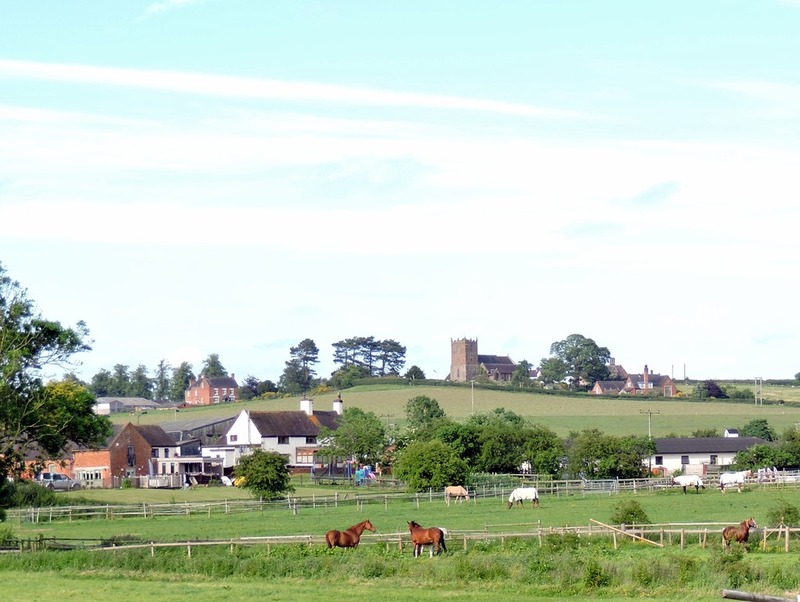 When Joy felt better she went and investigated Audlem Mill while I attempted to get better performance from our TV aerial by dismantling it and cleaning all the internal connections, what else can go wrong with a TV aerial? Later we walked around the village. In the morning we watered up before descending the remaining 3 locks of the Audlem flight, which were easily accomplished as there were many more boats on the move, some of them trade boats headed for the Floating Market at Market Drayton this weekend.At bridge 85 we stopped for lunch and then visited the (not so) Secret Bunker. For over 50 years this vast underground complex, remained secret, hidden on the outskirts of a sleepy Cheshire town. Declassified in 1993, the 35,000 square foot underground bunker would have been the centre of Regional Government had nuclear war broken out. 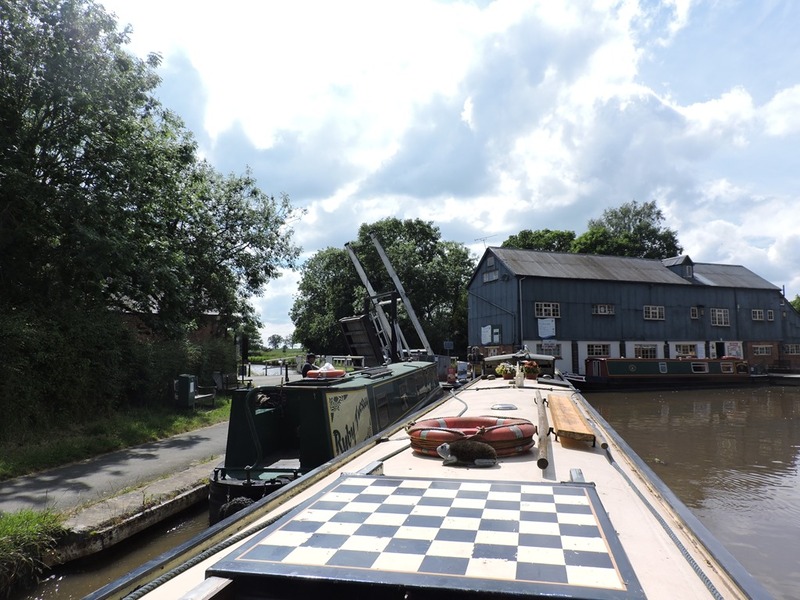 After our visit we immediately approached Hack Green Locks and passed Wildside Perserves’ Jam Butty moored up, returning from Middlewich Folk and Boating (FAB) Festival, we assume. Through the locks we continued the 3 miles to Nantwich and moored on the embankment above the town at about 3pm. Saturday’s weather was, as predicted, wet so we didn’t stray far from the boat. I did visit Talbot Wharf and buy some more rope to practice my splicing and I now have a selection of ropes to moor up with. 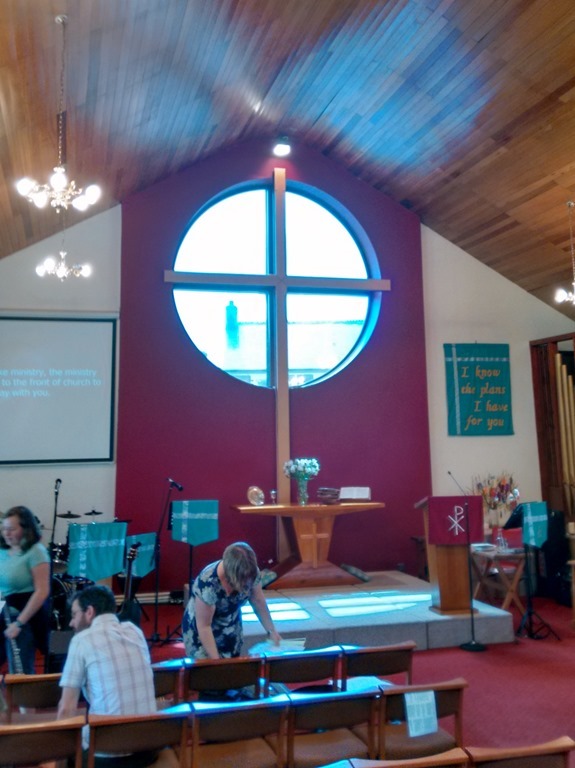 This morning we visited Market Drayton Methodist Church and joined them for their 11am service, we received a warm welcome and enjoyed worshipping with them. Today’s church is designed for all-age worship; it is warm and light, with comfortable chairs. It is on two levels; the raised section with rear door access, is wheelchair friendly. The Cross in the large circular window is an impressive and prominent feature. 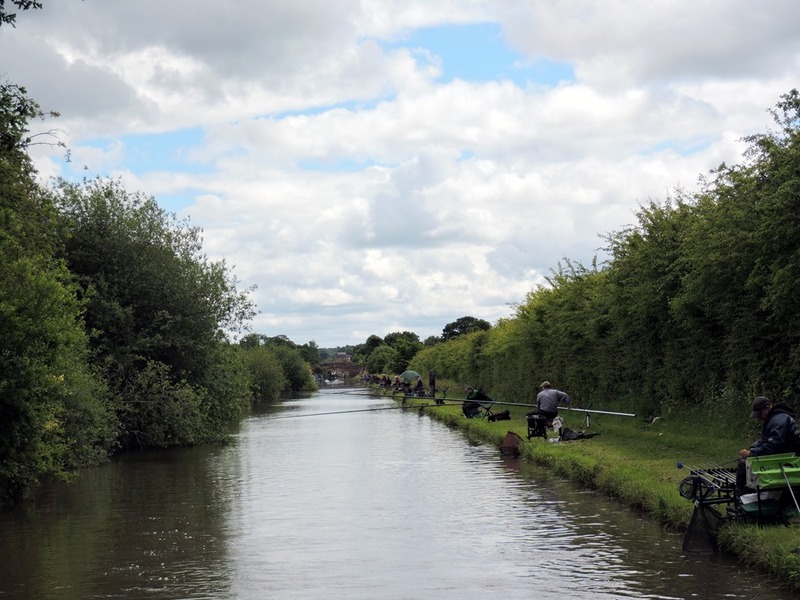 On our return from church we set off straight away and immediately after the first bridge we encountered a fishing match stretching for about a mile, the guys were very good humoured as they raised their rods to let us through. We had a clear run through to Adderley locks where we met two guys bringing a Springer narrowboat bought on eBay back from Birmingham to Skipton! They had had a couple problems the current one being a faulty water pump and they were having to keep the single cylinder engine cool by dousing it with a a watering can full of canal water occasionally. After the locks we caught up with them stuck in the shallows where the wind had blown them, we offered to tow them off and nearly got stuck ourselves. 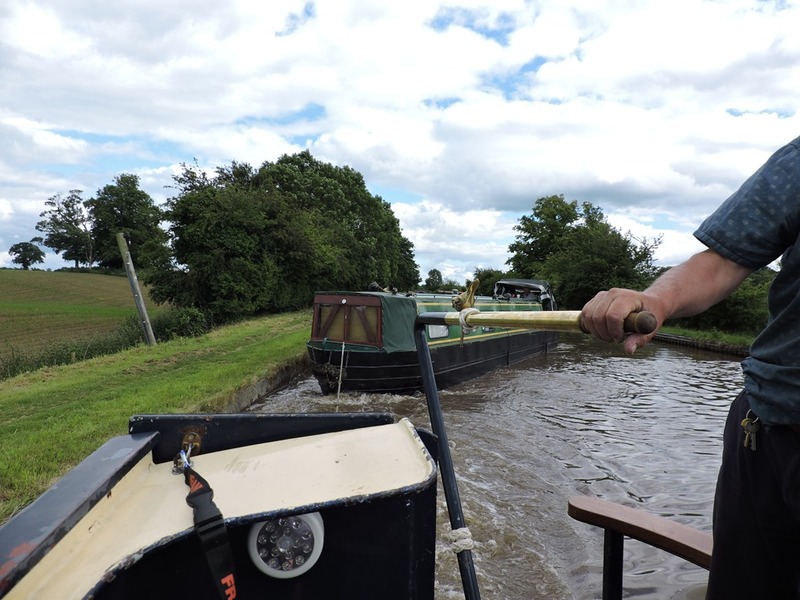 We got off successfully though and towed them down to Audlem locks to give the ailing engine a rest, we left them there as we were mooring up for the night. We hope they manage to get a spare impellor at Nantwich tomorrow. There was a canalside stall at the top lock where we bought some eggs and then found ourselves a mooring after the second lock where Catty could go out exploring. We said goodbye to Gnosall (which we were reliably informed by a local is pronounced Knowsall or maybe it’s Nose-al) and it was just an hour’s jaunt to Norbury Junction where I wanted to visit Norbury Wharf to buy some fittings to make a better job on repairing the drip on the diesel leak-off pipe. Unfortunately it wasn’t in stock but they could order it for delivery the next afternoon, not to worry we’re in no hurry and there was washing to do, we enquired if there was a local laundrette, no.. but they could do a service wash for us, even better! Our part didn’t turn up until 4:30pm the next day but no matter, we filled our day, me pottering about and Joy did some art work. We finally got away at 5 o’clock and just did an hour’s cruise to The Anchor at High Offley. After a mushroom risotto for tea we visited the little pub which is an absolute delight, you could be stepping back a 100 years, just a simple bar with wooden settles/benches and scrubbed tables arranged for conversation! 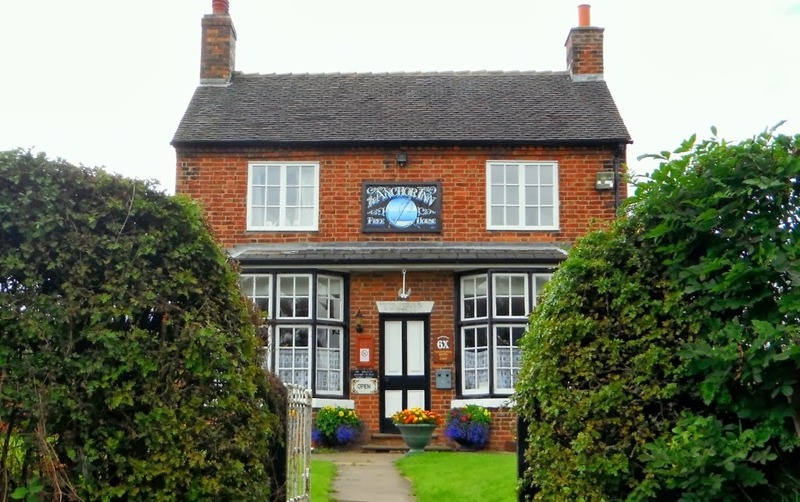 Check out the reviews in this link, apparently 2 landladies in 105 years, Olive being the second and current one. We chatted with Mal Edwards the local fender maker and a visiting boater who it transpired not only came from Dursley (where we lived for 30 odd years) but was brother to Howard, a friend and owner of Dursley Garage which was next to my first business premises (now demolished). This morning we were on our way again at half past nine, past the former Cadbury’s Factory at Knighton and in a couple of hours we were passing through the impressive Woodseaves cutting hewn through the solid rock. We stopped for lunch just before Tyrley Locks where a Black Prince hire boat was having problems opening one of the lock gates and had called C&RT, but before their man arrived from 25 miles away they and another boat had managed to ascend to lock and we were going down. Neither we or the C&RT man could find any problem. 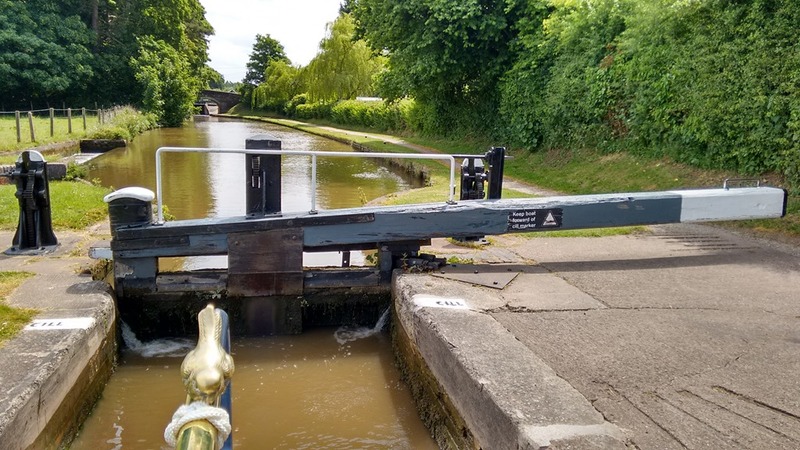 The five locks were negotiated very easily meeting boats at every lock which saves closing gates as we leave the lock (note the grey Shroppie lock beams as opposed to the common black). 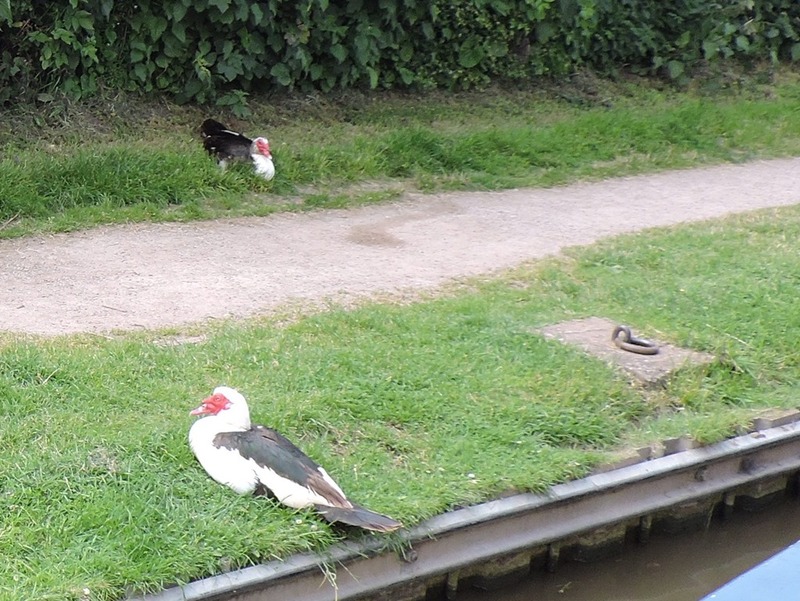 By 10 past 2 we were mooring up in Market Drayton where we annoyed two Muscovy Ducks by disturbing their afternoon nap. We have new(ish) housing opposite facing and embracing the canalscape. 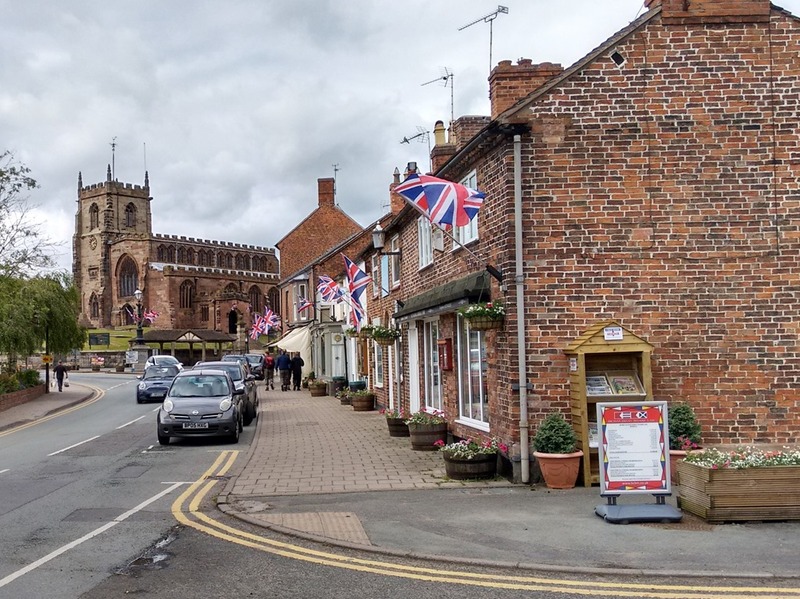 This afternoon we walked down into the town which has a surprising mix of modern and half timbered buildings, Asda, Wilkinsons rubbing shoulders with independent shops, cafes and pubs. Tomorrow is market day and we may stay to look around some more, depending on the weather.